Beyoncé and Jay Z partied until 3am in London together following the blonde beauty's show at London's O2 Arena on Saturday night. Beyoncé and Jay Z partied together until the early hours of this morning. The couple - who have two-year-old daughter Blue Ivy - danced the night away at the Mason House nightclub in London after the XO hitmaker put on a stunning performance at the O2 Arena earlier that night as part of her Mrs Carter World Tour. The 32-year-old singer appeared to be fresh faced as she left the club in an over-sized bomber jacket and black skinny jeans, while her husband, Jay (44), opted for a black and grey patterned shirt, with a thick star medallion hanging from his neck. Meanwhile, the pair surprised fans on Friday and Saturday night as the rapper joined the blonde beauty on stage for their latest collaboration, Drunk in Love. 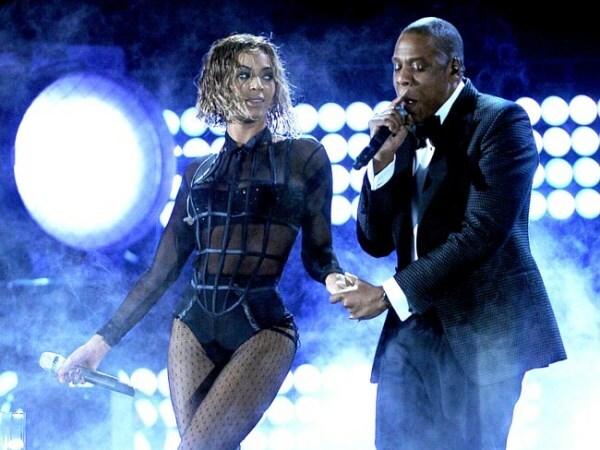 The surprise appearance from Jay was the icing on the cake for Beyoncé, who clearly revelled in the opportunity to perform new material for fans for the first time on her revamped world tour. The Mrs Carter Show World Tour 2014 will continue to travel across Europe throughout the month of March.